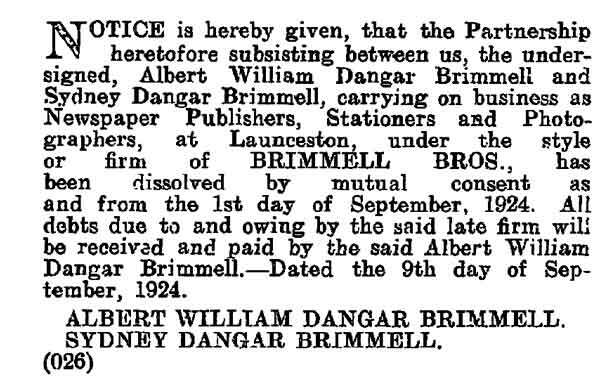 Albert William Dangar Brimmell | Launceston Then! Albert, or William as he was known, was born in 1868 to John and Elizabeth Brimmell at 11, Church Street, Launceston. Albert was educated at Horwell Endowed School under the headmastership of Richard Reed and then at Dunheved College under the headmastership of Benjamin Ralph. On leaving school, William joined his fathers Newspaper and Stationers business, becoming a well regarded journalist. On his fathers death in 1899, along with his brother Sydney, he took over the business. William married Rhoda Sherston in 1896 at St. Columb, and a year later their daughter Winnifred was born. In 1924, the business partnership with his brother Sydney was dissolved and in 1931 the ‘Launceston Weekly News’ was taken over by the ‘Cornish and Devon Post.’ For the next few years he worked as a free-lance journalist. He was a well known Mason, filling the position of Worshipful Master of ‘Lodge Dunheved’ at one time. He was a conservative in politics and a Wesleyan. William died at his home ‘Fernleigh’ The Walk, Launceston, on June 11th, 1937 leaving a total of £456 18s. 4d. to his widowed wife Rhoda. After a a service held at his home, he was interred at the Launceston Cemetery.